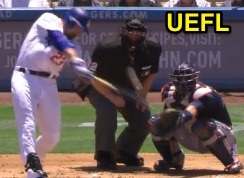 Umpire Joe West's Blue Cowboy CD served as at-bat music during Sunday's Braves-Dodgers game in Los Angeles, the home team opting for the country music selections during their time at bat in the bottom of the 1st inning. The idea, which came from perpetually-controversial middle infielder Chase Utley, saw the Dodgers start the frame with a 2-0 deficit to Atlanta, and, after Joe's serenade, end the inning tied at two. 7) Yasmani Grandal - Out at Home (Diamond Dreams - Joe West [repeated]). This may be the first time Joe West's CD has been played to introduce batters at a baseball game, but it isn't the first time the Cowboy's music has been heard at a Major League stadium in some form—it's not even the first time Joe West has been played over the speakers at Dodger Stadium. 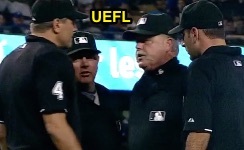 In 2015, Dodgers guest organist Gil Imber played Joe West's "Blue Cowboy" and "Cole Younger" on the organ during an umpire discussion, albeit amongst Jim Joyce's crew (video of this sequence below, via "read more"). Likewise, Red Sox organist Josh Kantor has previously played West's music in Boston on the Fenway Park organ.